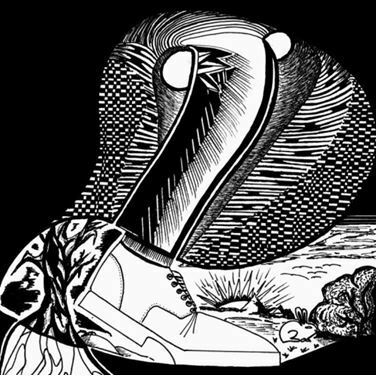 Cut to the chase: Malady is a progressive rock band from Helsinki, Finland. I had the chance to see the band live couple of weeks ago at Bar Loose in Helsinki. I can’t say I’m a devoted fan of prog rock, but I love a lot of the 70’s sound. And I wouldn’t even use the term “progressive” here unless it referred more to that definite 70’s sound, the rich and adventurous soundscapes giving way to blues. This is the catch: Malady’s sound is significantly bent towards blues. I could spend this whole post name-dropping the obvious influences in their sound, but the truth is: Malady stands more than firmly on it’s own feet. It skips the cheerful hippieness of Haikara or the country-poppish melodies of Wigwam and slides into a more sorrowful sound. Restful moods grow into melancholic guitar solos, which are supported by the flowing rhythm section. And – don’t you just love the sound of Hammond-organs? Hearing it live, the holy-like sound of Ville Rohiola’s instrument simply blew my mind – the feeling was somehow ethereal yet organic. There’s an element of decisiveness to the sound. It just doesn’t fit into my head, why this instrument was so left behind when the first synthesizers came out in the 80’s. Unessakävelijä is a prime example of the englishness in Malady’s sound. The song travels from Pinkfloydish bassline intro to Black Sabbathian guitars (or even Iron Maidenish! ), then slowing to a floydish piano and back to Sabbath again. Something borrowed, something blue, all Malady.